Heavy rain not snow with this weekend's wintry weather threat. Gusty winds come Sunday. Another weekend and another round of wintry weather for Central Maryland. Winter Storm Warnings have been issued for Carroll, Northern Baltimore, Frederick, Washington, Allegany, and Garret counties from Saturday midday through 6am Sunday morning. These locations will hold onto the cold air longer creating issues with mixed precipitation leading to travel disruptions and power outages. Winter Weather Advisories are in place for Baltimore City, Harford, Southern Baltimore, Howard, and Montgomery counties from Saturday afternoon through late Saturday evening. A quick thump of snow is likely in these areas before a change to ice and eventually rain. Travel concerns are possible especially before the changeover late. Conditions will be dry early in the day so take advantage of it. Conditions will deteriorate as the afternoon and evening move on especially along the PA/MD State Line. 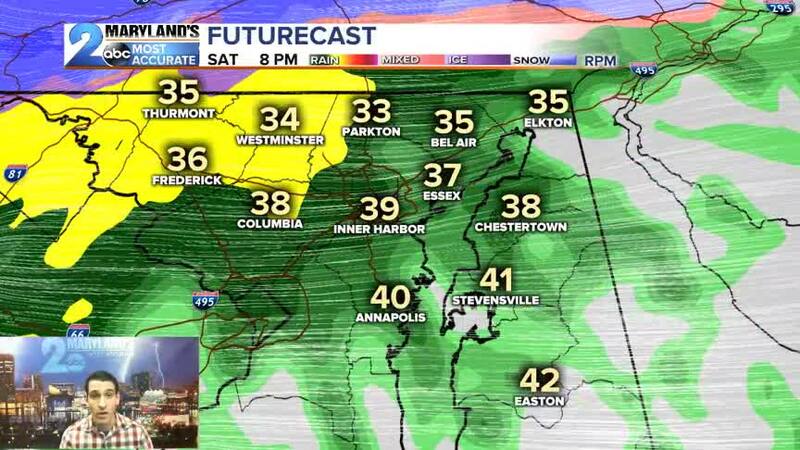 Wintry weather starts to move into the Baltimore metro and surrounding suburbs between 2-4pm Saturday afternoon. Most locations will start as snow /ice mix before a transition over to rain after Saturday 10pm. Further south of US-50 we are likely to see a brief mix before a changeover to heavy rain for the duration of the event. Temperatures down toward Annapolis and along the Eastern Shore could touch 50 degrees during the wee hours of Sunday morning. Snow totals with this storm look to be confined to the northern and western suburbs of Baltimore. Areas such as Carroll and Frederick counties will see the heaviest amounts of both snow and ice. Further south in Baltimore and along I-95 a quick coating to 2" of snow is likely on the front end before that changeover to rain. The trickiest travel will be along the I-70 WB corridor, MD 29, MD 32, US-15, I-81, and I-83 NB toward Parkton/Hereford/York. Heading south down I-95 toward Glen Burnie and Washington DC road conditions will be wet with some localized pockets of flooding creating hydroplaning concerns. I-97 and US-50 into the Eastern Shore will see much of the same. Wind restrictions look to be issued Sunday for the Bay Bridge and much of Kent Island as gusts topple 40 mph. Everyone will experience a FLASH FREEZE come Sunday midday into the afternoon as temperatures tank below freezing. Plan accordingly for slick travel concerns as anything that is liquid will freeze immediately especially on those elevated surfaces. Road conditions won't improve much as we head into Monday since temperatures will struggle to get out of the teens. Heavy snow moves by 2-4pm Saturday. Road conditions are likely to be impacted fairly quickly as temperatures hover around 27-31 degrees during the bulk of the event. Areas around South Mountain and along US-15 toward the Catochtins could see snow amounts around 4". US-340 toward Boonsboro/Brunswick and I-70 West Hancock/Sideling Hill likely to see 2-3" amounts as well due to extra lift from the mountains. Icing will also be an issue in these areas with many locations picking up close to 0.25" in accumulation. Prepare for dangerous travel and power outages. Wind chills come Monday morning 10 to 20 degrees below zero. Snow moves in by 3-5pm with a gradual transition to rain late Saturday night. Slippery roads are likely especially on elevated surfaces such as I-83 from the City north to Parkton. Problems are also likely to occur north of MD 136, MD 152, and the PA/MD line even with amounts there around 1-4". Most areas like Towson, Eldersburg. Taneytown, Monkton, Cockeysville, White Marsh, & Middle River are looking at Dusting-1" of snow. A light glaze of ice is expected with amounts of 0.05"-0.10" accumulation expected. Areas north of MD 136 could hang on to the frozen precip through midnight creating additional travel concerns. These areas will see mainly rain. Precipitation will start with a few flakes and some freezing rain before temperatures rise fast above freezing. Heavy rain is likely with 1-2" expected and the concern for bay flooding is there. Winds could gusts 40-50 mph by Sunday afternoon with a flash freeze as well. Our storm system departs pretty quick Sunday midday leaving in it's wake a polar plunge for MLK Day. It looks to be the coldest air by far this Winter with single digit lows Sunday and wind chill factors of 10-20 degrees below zero early Monday morning. Highs on Monday will be in the teens before a rebound back to freezing Tuesday. Another storm follows this one with rain for the middle of next week. For more info follow Meteorologist Erik Taylor on TWITTER & FACEBOOK. Also don't forget to download our free WMAR2News mobile app available at the Apple and GooglePlay stores.